First step is to clean, clean, clean !!! I sprayed my piece down with Dixie Belle White Lightening, wiped it clean and then went over it with a damp cloth to remove any left over cleaning resedue. 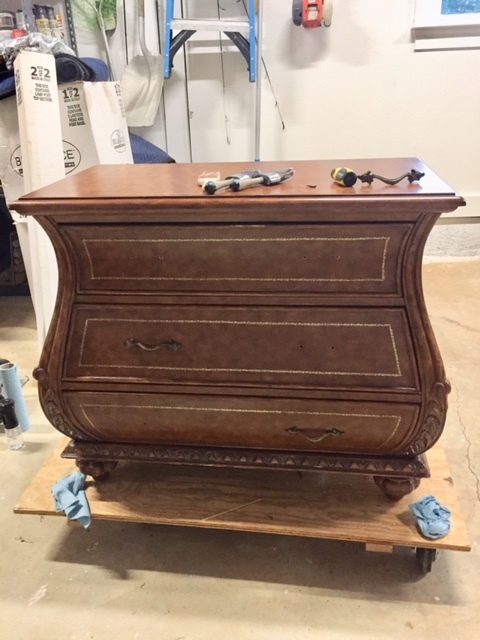 I couldn’t remove all the drawer pulls because some of the screws were stripped and so I knew I’d have to paint all the drawer pulls to match the drawers. Next step was to give it that “dipped” look. I painted the bottom in Dixie Belle’s new color “Coffee Bean”. Its a rich dark brown. I start at the bottom and pull my brush upwards toward the top so that the brush was almost out of paint at the end of my stroke giving it a “feathered look” or “jagged edge”. I did 2 coats of the Coffee Bean using my Cling-S50 Brush. Then I used Dixie Belle’s Dried Sage (a very khaki looking color with a hint of green undertones). I started my brush strokes at the top and brush towards the bottom allowing the brush to leave the same feathered / jagged edge at the end of my brush stroke. The picture shows what it looked like after 1 coat, but I went back and added 1 more coat for a good solid coverage. Now the fun really begins. I used Dixie Belle’s Bronze Patina Paint in an up / down motion to blend the Dried Sage and the Coffee Bean’s edges together. For this I just used a chip brush. 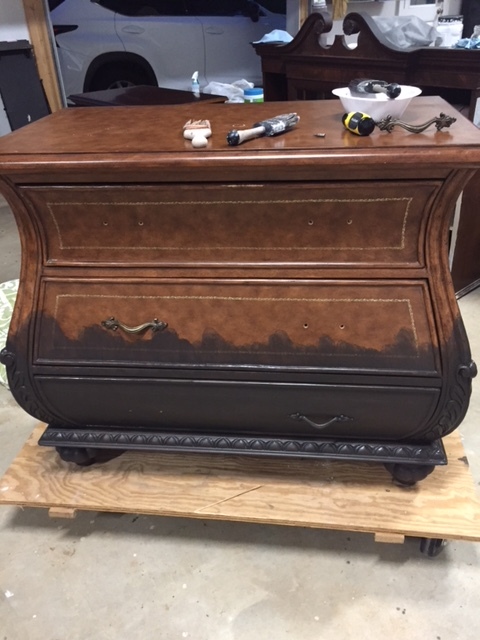 I also added the Bronze Patina to the top of the Bombay Chest as well for added fun and interest 🙂 I let that dry completely before going on to the next step. 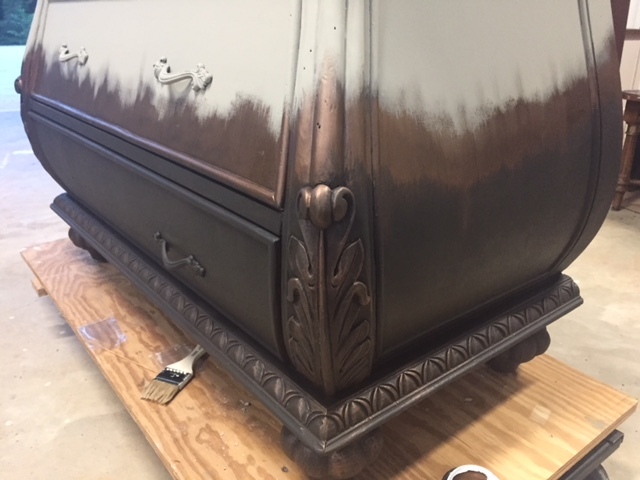 Now that the 1st coat of bronze patina is dry, you can apply the second coat….. but make sure you have your activation spray (Green or Blue) ready along with any other materials you will need (i.e. sponge, paper towels, brush, baby wipes). The Blue or Green spray (I used Blue) will need to be applied to the bronze patina paint while it is WET, so you have to move quickly and work in smaller sections. 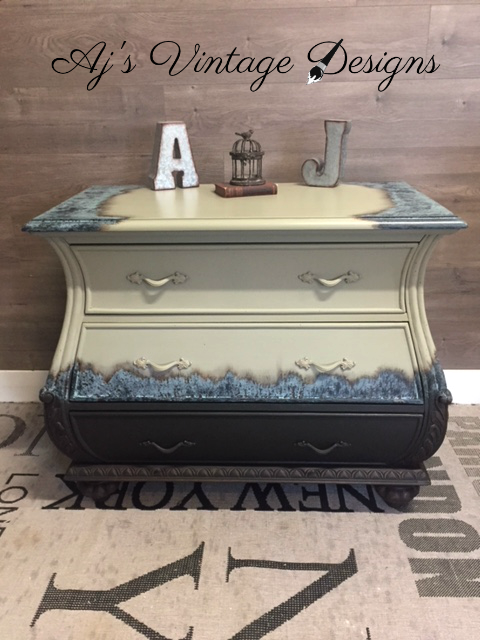 For this project, I applied the Blue Spray with a sea sponge for a heavy patina look. I poured the spray into a bowl and then dabbed it onto the wet bronze patina paint. The activation happens pretty quickly ( this picture is taken 30 minutes after the blue spray was applied). If you are using the Iron with the Green spray for a rusted look, be prepared to wait 24 hours to see the full effect. Now its time to seal it. Even though people will say “it doesn’t have to be sealed”, I still do because I want the finish to be protected and I also want to stop it from continuing to react…. Once you’ve sealed it, that’s the look that will stay there. I sealed the top with Gator Hide (so it can withstand heavy use) and I finished up the body using Dixie Belle’s Easy Peasy Clear Wax. I hope you enjoyed this tutorial. I have had so many requests for this one, I’m glad I took pictures while I worked on this piece so I could share it with you.